After Algeria and India, Vietnam is next in line to become a strategic partner of Moscow in the area of military-technical cooperation. Russia seriously intends to strengthen its positions in South East Asia. That is the conclusion of experts following a recent visit by Defense Minister Sergei Shoigu to Vietnam. After Algeria and India, Vietnam is next in line to become a strategic partner of Moscow in the area of military-technical cooperation. In the very near future, Hanoi will be supplied with modern air and coastal defense systems, fighters, and non-nuclear submarines. Russian military academies are also set to begin training Vietnamese military personnel. 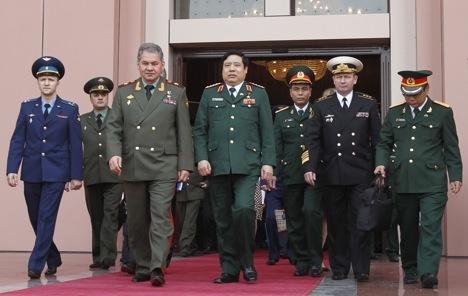 Shoigu's visit to Hanoi can be considered historic. He has effectively reopened the country, which Russia was forced to leave in the early 1990s after the collapse of the Soviet Union. At that time, Vietnam was one of its main allies and partners in the region, and Moscow and Hanoi enjoyed close military-technical cooperation. Since Soviet times, the Vietnamese city of Cam Ranh had been a logistics point for the Russian Navy, and a 25-year lease agreement on a gratuitous basis was concluded between in 1979. But in 1989, Vietnam expressed a desire to receive payment for the base. As a result, in 2001 President Vladimir Putin decided not to renew the contract and to decommission the base ahead of schedule. One of the reasons was the lack of military funding; another was Russia's specific interests in the region. A turning point in the history of bilateral cooperation was President Nguyen Minh Triet's visit to Moscow in October 2008. During the visit, an intergovernmental memorandum on cooperation in the sphere of military-technical cooperation was signed through 2020. As a result, in the last three years alone Russia and Vietnam have signed contractual obligations for the supply of military equipment worth more than $5.5 billion. Vietnam is one of Russia's key partners in the area of military-technical cooperation. Russia supplies the country with submarines, missile boats, modern fighters, and aviation weapons. It is also a crucial partner in many other related fields. In particular, Russia is building a nuclear power plant in Vietnam and producing oil in the country's offshore coastal zone, says Ruslan Pukhov, head of the Center for Analysis of Strategies and Technologies (CAST). The special place occupied by Vietnam in the field of military-technical cooperation is evidenced by Moscow's delivery of 20 Su-30MK2 fighters for $1.5 billion. The planes are among the most advanced in the world. Russia's latest combat training aircraft, the Yak-130, is now gaining ground in the Vietnamese market. This next-generation machine is of interest not only as a pilot trainer, but also as a light attack aircraft. Also on the table is the MiG-29 SMT, and Vietnam has shown interest in purchasing a batch of Il-476 military transport aircraft with new PS-90A engines. Production of the latter began this year at the Aviastar plant in Ulyanovsk. Within the framework of cooperation in the field of military aviation, JSC Sukhoi is in talks to set up a regional center in Vietnam to service Su-series aircraft. In 2011, Vietnam became the largest recipient of Russian naval equipment. According to CAST, the country procured a Gepard-3.9 frigate (Project 11661E) for $175 million and four Svetlyak patrol boats (Project 10412) at a total cost of $120 million. The vessels are armed with the Klab strike complex and Kh-35 Uran missiles. As part of these supplies, Moscow and Hanoi plan to develop a joint missile analogous to Russia's Kh-35 Uran. It will be developed on the same principle as the BrahMos project, a Russian-Indian joint venture. The Uran is one of the most advanced Russian anti-ship cruise missiles. It can be launched from a surface or underwater vehicle (the Klab complex), or as part of the Bal-E coastal anti-ship complex. The Kh-35 is unique in that it is immune to enemy radar interference. Besides active mode (when the target seeker is enabled in a split second), the missile can also fly in passive mode, i.e. in full radio silence, whereby instead of scanning the surrounding space, it detects pulses emitted by the target. The aircraft flies at a height of 2-3 meters above sea level — below the deck of a ship, making it undetectable to radar. Incidentally, this capability is highly rated by the United States. It is rumoured that the homing head of the Kh-35 will be fitted on the U.S. ASM Harpoon. No less promising in the area of mutual cooperation with Hanoi is the supply of modern air defense systems. In the summer of 2003, it concluded a contract for the supply of two batteries of S-300PMU-1 anti-aircraft missile systems worth approximately $230 million. The complexes partially replaced the Soviet-era S-75 air defense system, which had been in service in Vietnam since 1965. There is also the issue of modernizing the S-125 Pechora, currently in operation and of which there exist around 40. Moscow is offering to upgrade them with the Pechora-2M, a modernized variant. Despite the advancing years of the S-125 system, the Pechora-2M is an entirely new development. For example, 90 percent of the electronics have been replaced. It all meets the latest requirements, ranging from the computer processors to the color LCD displays providing an overview of the aerial situation. The new complex allows the launch facilities to be sited 10 km from the control room and antenna station (instead of the previous 70 m), which significantly increases the survivability of the complex under enemy fire. The modernized SAMs have twice as many launchers (eight instead of four), double the target detection range in conditions of radio interference, and five times the mean time between failures. Moreover, the nomenclature of spare parts has been reduced tenfold: from 3000 to 300. Crucially, the Pechora-2M also features thermal imaging for night-time operation in passive mode, which makes the complex practically invisible to enemy intelligence. But the main know-how lies in the radar defense system: a device the size of a shipping carton diverts self-guided enemy missiles away from the Pechora-2M antenna station. During his visit to Hanoi, Sergei Shoigu said that Moscow was fulfilling a contract to supply non-nuclear submarines to Vietnam, as well as to train crews for them. The contract for the supply of six Varshavyanka submarines under Project 636 (two have already been delivered) was signed in late 2009. The deal is worth $1.8 billion, and all the submarines will be equipped with the Klab missile complex. In addition, Moscow will build a base for the vessels in Vietnam. It is this factor, according to Kozyulin, which assures Moscow's dominant position in the Vietnamese market. And this is despite the improving relations between Hanoi and Washington, which in recent years has been seeking entry into the Vietnamese market. In particular, the U.S. has been probing the idea of leasing the Soviet naval base at Cam Ranh.